Black crown, nape and bill. Wings and upper parts slate (blue-gray) with brown and black fringe. Brown and black tail feathers with white bars. White from the sides of its head and neck to its underside. Straight, rather long, partially black beak. Usually a year around resident, it inhabits deciduous and mixed forests, groves and wooded towns in southern Canada, throughout most of continental United States and northern Mexico. Builds nests of leaves, feathers, hair and bark in natural or abandon woodpecker cavities or birdhouses. Nuthatches also sometimes excavate their own cavities. Females lay six to eight, more or less, sometimes as many as ten speckled eggs. Young hatch after less than two weeks incubation and leave the nest in about another two weeks. 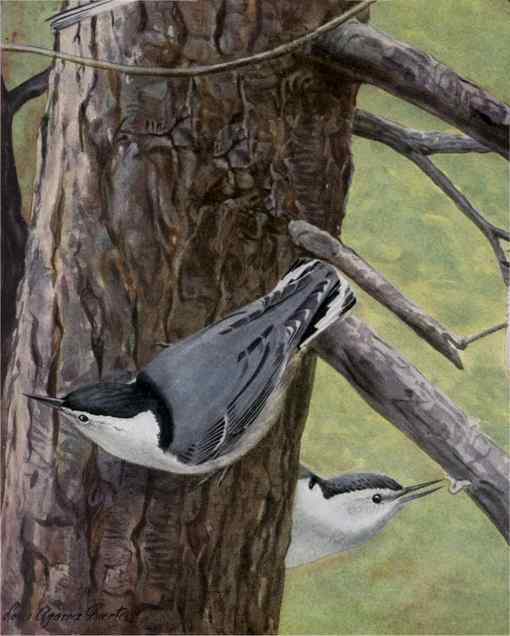 Tiny hook shaped claws enable nuthatches to flit dexterously on, underneath, up and down (mostly down) tree trunks and limbs eyeing crannies and crevices sometimes prying loose bark searching for insects, spiders, larva and eggs. 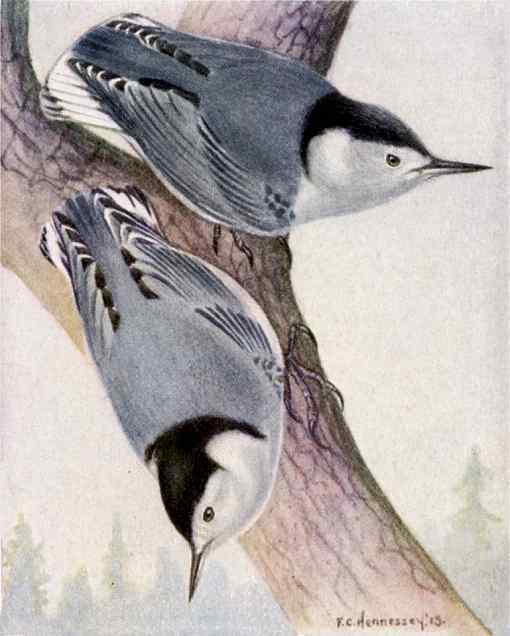 White-breasted nuthatches help keep tree diseases and insect carriers in balance. They also eat seeds, and berries. Sometimes they become accustomed enough to people to take seeds from their hands. In winter they are often seen foraging together or mixed with downy woodpeckers, other nuthatches, chickadees, and titmice and at seed and suet feeders. If you mount a Winter Warmer and occasionally lift the lid, you may see several cuddling nuthatches and possibly with chickadees and titmice. The White-breasted Nuthatch Birdhouse (same as for the Red-breasted Nuthatch, Titmice and Chickadees), has a 4″ by 4″ floor, 9″ inside ceiling, 1 1/4″ diameter entrance hole located 7″ above the floor, ventilation openings, and a hinged roof secured with shutter hooks. Assemble with screws fit to pre-drilled pilot holes. Install nest boxes for white-breasted nuthatches in forests or groves on a tree or post with partial sun and shade between four and twelve feet high. Out of reach is best to deter the curious, unless the box is well concealed. Remove the nest from the box well after the brood rearing season is past. Chickadees, titmice, wrens, downy woodpeckers and other nuthatches may use this box. Black crown, nape and bill. Wings and upper parts slate (blue-gray) with brown and black fringe. Brown and black tail feathers with white bars. White from the sides of its head and neck to its underside. Straight, rather long, partially black beak. Females lay six to eight, more or less, sometimes as many as ten speckled eggs. Young emerge after less than two weeks incubation and fledglings leave the nest in about another two weeks. They store nuts in the crevices of bark which are retrieved in winter when insects are fewer and the nuts are chopped apart (hence their name.) They also eat seeds, and berries. Sometimes they become accustomed enough to people to take seeds from their hands. The White-breasted Nuthatch Birdhouse (same as for Red-breasted Nuthatch, Titmice and Chickadees), has a 4″ by 4″ floor, 9″ inside ceiling, 1 1/4″ diameter entrance hole located 7″ above the floor, ventilation openings, and a hinged roof secured with shutter hooks. Assemble with screws fit to pre-drilled pilot holes. Install nest boxes for white-breasted nuthatches in forests or groves on a tree or post with partial sun and shade between four and twelve feet high. Out of reach is best to deter the curious, unless the box is well concealed.